... they've 'done their homework' and ask good questions. They value authenticity and locally-grown and produced products. At the winery, we taste and we talk. Often a dialog or tête-à-tête, sometimes a discourse or an oration, and, occasionally, a debate. Not always about wine; maybe the good old days, the Old Country, grandchildren… Understanding an unfamiliar wine is the first step to its appreciation and enjoyment. Take it home and share, we would love that. No tasting fees, signs, or rules in general, save one: respect. As respite for the quiet folk, we also offer wine by the glass and cheese platters and other simple fare. Though legal, we will not uncork a bottle for consumption on premises. Please note that we do not allow limos, buses, vans or other commercial vehicles at any time, for any reason. Also, we do not host bachelor/bachelorette parties or any private functions at this location. Our home location is located in Kresgeville, but our physical address is now in Kunkletown according to the new 911 address changes. We think they must consider Kunkletown a state of mind rather than a place, as it's technically 5 minutes down the road from us. We are located on Keller Road, right around the corner from where it intersects with Whitey B. Road. You'll see our sign next to a big red driveway. Feel free to call us if you're lost. There are a lot of farms and fields and not much in the way of flashy entertainment, but the simple pleasures around us more than compensate. Right around the corner is Haydt’s Meat Market. When you read “free range organic” on a meat label, this is the idyllic farm you imagine. Their beef is phenomenal, and don’t get us started on the bacon. They also happen to have a smoked horseradish cheddar that pairs perfectly with our Vin Di Pasqualina. A good hoagie is worth its weight in gold. (For those of you who refer to them as subs or heroes, hoagie is the preferred local vernacular.) The Kresgeville Deli is a great place to grab a sandwich, fries, and ice cream. Their Reuben sandwich is particularly delicious. 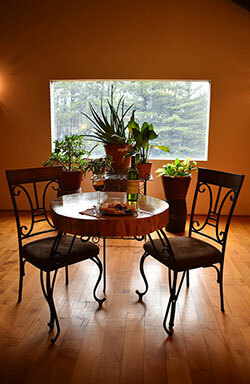 A little further up Route 209, our friends at Aces Gourmet serve up some great food. Millie, our resident Sicilian grandma, swears by their soups. They make great wraps, salads, cookies, and muffins to grab and go. If you like what you taste, they also do catering. Close-up of one of Phoebe Conrad's fairytale dioramas. 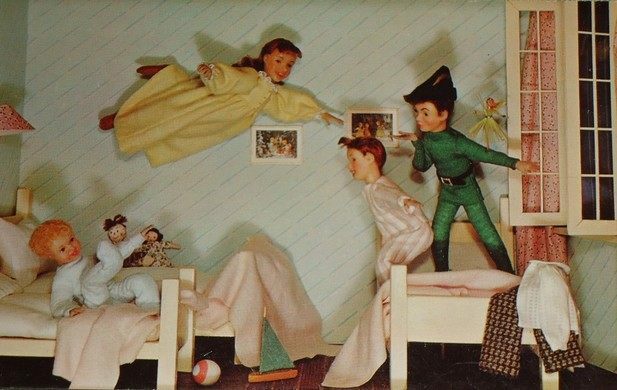 Peter Pan teaching Wendy and her brothers to fly. When you’re this close to Brodheadsville, we recommend paying a visit to a very beloved local exhibit at the Western Pocono Community Library. It houses a collection of dioramas by the late and great Phoebe Conrad. She made a very impressive series of scenes from children’s stories. She carved each figure from wax, sewed their little clothes, and painstakingly constructed tiny furniture and foliage. The attention to detail is outstanding, right down to the tiny words “Some Pig!” woven onto on Charlotte’s Web. 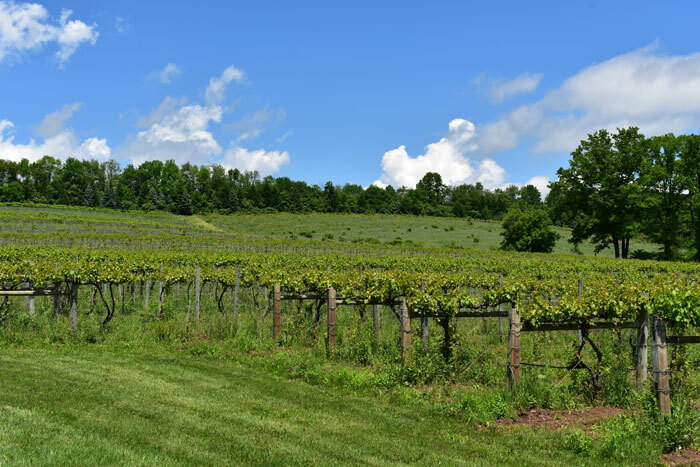 Our winery is also a stone’s throw away from Beltzville State Park. It boasts a 525 foot sand beach, paddleboat/kayak/motorboat rentals, trails for hiking and biking, and areas to hunt and fish. Visitors may also water ski, if they wish. It’s the perfect location for a picnic, and during summertime they do have a concession stand with food available. A covered bridge built in 1841 across the Pohopoco Creek was relocated to the park at public request, to be used by pedestrians. It bore horses and buggies back in its day. 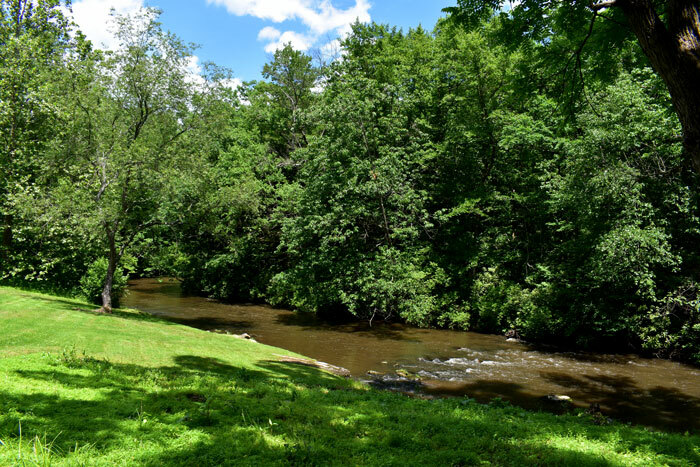 Hickory Run State Park is only a twenty minute drive away. It’s enormous – over 50,000 acres. It features over 40 miles of hiking trails, a beach, miles of trout streams where you are able to fish, hunting grounds, extensive campgrounds that also offer cabins for rent and hot showers/bathrooms, and geocaching. But the most striking feature of all is Boulder Field, a National Natural Landmark. The vast expanse of stones is truly a sight to behold. Nana and Aunt Jo made the journey to see the property. The entire kit-and-caboodle was on sale for $2800, including the various buildings. We still have that set of Melmac dishes. Their husbands, Kiki (Millie’s father) and Uncle Dom, split the cost of the property and kept 40 acres apiece. Kiki chose the acreage upon which the vineyard now sits. Uncle Dom chose the acreage up on the hill. The Pohopoco - "Big Creek". Lots of memories here for many generations of our family. 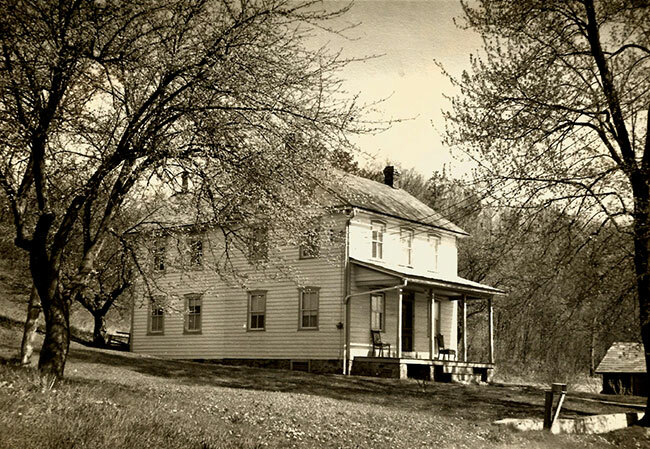 The old farmhouse was given some much-needed repairs. Uncle Dom and Aunt Jo lived there for a time until they built a log cabin elsewhere on the property. Kiki and Nana took up in the old farmhouse. The old farmhouse. This was torn down in 1989 to build Stephen's house. He made sure that the front door is in precisely the same place. Over the years, Kiki cleared all the land on the stream side of the road, making a clear and perfect view of Big Creek. He worked tirelessly to make the property into the paradise he envisioned. A portion of the upper vineyard, right outside of the winery building. We have 26 acres of grapes on 86 acres of land. Millie says what her father lacked in formal education, he more than made up for with common sense.